We are still in the midst of our twelve days of Christmas here, and will be heading out soon to celebrate some more with friends of ours. This year we have had a very nice Christmas celebration, we have spent a lot of time with family and friends with plenty of good food and treats. I really enjoyed catching up with my family, it is so nice to see everyone! 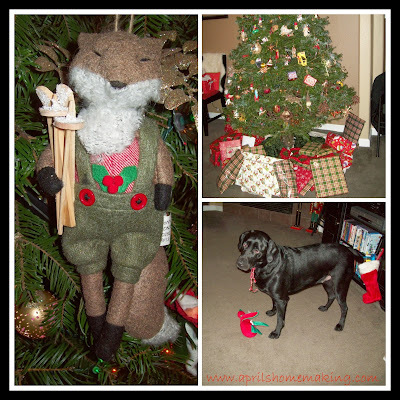 We all had fun Christmas morning exchanging gifts, even the dogs got in on the action and had fun opening their Christmas squeaky ducks and dog treats in their stocking. 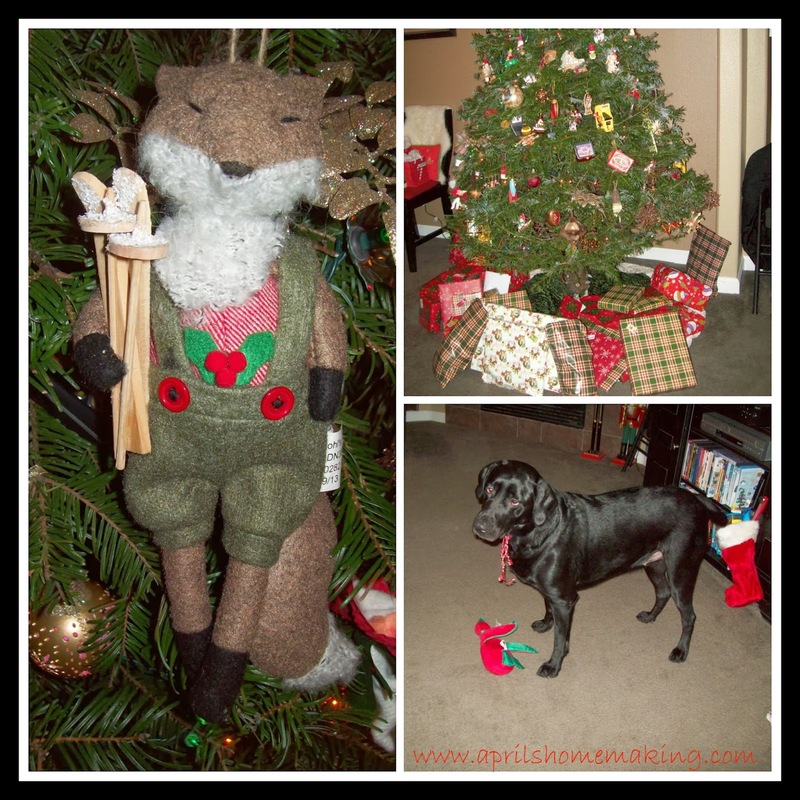 We all agree that the dog gifts are just as much a gift for the whole family, because the dogs are so fun to watch with their new treats, very entertaining! This year I had a lot of fun with a gift that I made for my mom, sisters, and grandma. I have spent quite a bit of time organizing old family photos, and getting them scanned onto the computer, so I decided to make a photo book of our mom and her family and me and my sisters through the years. I made the book at Walmart.com and I was very happy with how it turned out, everyone really enjoyed looking through all the old photos. I also included two sections of Christmas Past pictures, one set from the 50's and 60's and another set of the 70's and 80's, it was so fun to see the old styles of Christmas decor and types of gifts. 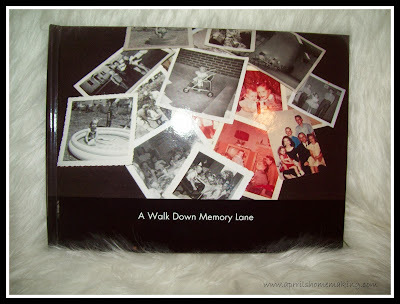 I titled the book A Walk Down Memory Lane, and for the cover photo, since I couldn't choose one picture, I decided to take a picture of a random pile of some of our vintage family photos, I really liked how it turned out! This was a very fun Christmas project! On Christmas Eve we celebrated with Gary's family, his mother brought over Chicago Beef sandwiches which she had ordered all the way from Chicago from Portillos.com, Gary and his family are from Chicago, and being in Oregon we don't get to enjoy these classic Chicago treats too often, they were delicious! On Christmas day I had my family over, and we had a Christmas lunch buffet, I made croissant sandwiches, with chips and dips, and a couple of salads and BBQ Little Smokey's. We had lots of Christmas cookies on hand to nibble on, as well as plenty of Candy Canes and Old Fashioned Ribbon candy (shown in the picture at the top of the page). I thought I would share my two salad recipes from the day. 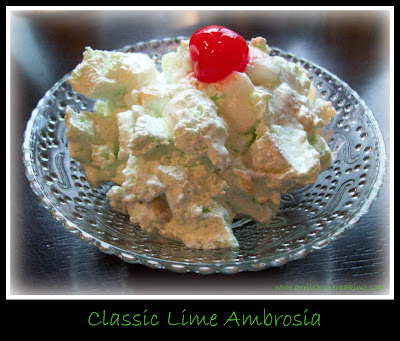 I made a classic Lime Christmas Ambrosia and my favorite salad, Broccoli, Bacon and Raisin salad. In a large bowl combine Jello with 1 cup hot water stir until mostly dissolved, if the jello is still hot, add a few ice cubes and swirl around in jello until jello has cooled, remove any left over ice cubes. Add in both tubs of Cool Whip, and stir into the Jello, when the jello and cool whip are combined drain the cans of fruit and add the drained fruit into the Jello and cool whip, then fold in about 3/4 of the bag of mini marshmallows, fold it all together until combined. Cover and chill in the fridge until the Ambrosia is set up which takes about 3-4 hours. When you are ready to serve garnish the top with halves of maraschino cherries. This recipe makes a pretty huge bowl full, and is meant to serve a large gathering of people and is the perfect size for a potluck, you could easily cut this recipe in half if you only needed it for a family sized meal. This classic ambrosia is a nice sweet side dish, the kids seem to really enjoy it, I make a version with orange jello and mandarin oranges for Easter. 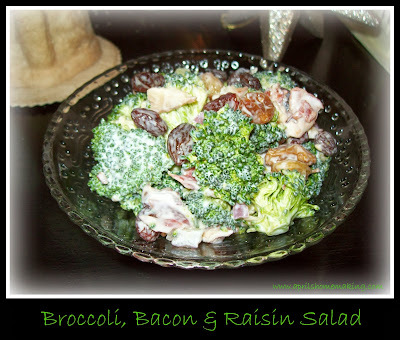 The next salad is a favorite in our family, Broccoli, Bacon, and Raisin Salad, this is a very easy salad to make and is always delicious for special meals and potlucks. I did not include amounts in this recipe because I make it according to how big of a bowl I want to make, and go by the look and taste of it. When I am making this salad for a large group or for a potluck I buy two full produce bags of broccoli, the type without the large stems. I start by cleaning the broccoli and cutting off the flowerettes into nice bite sized pieces, I do not use stem pieces at all. Add the broccoli to a large mixing bowl, along with the cooked and crumbled bacon ( I made a really large salad for a group of 17 people so I added two packages of cooked and crumbled bacon), add between 1 and 2 cups of raisins depending on how much broccoli you have, add between half to a whole finely chopped red onion ( you don't want too much onion, just enough for a little zest, I only add a whole onion if I am making a huge bowl of salad) Toss ingredients together and set aside. The dressing is also one of those recipes you have to taste to get right, and also make enough for the size of your salad. Start with 1 cup of mayo and thin it with 1/8th cup of milk, add two teaspoons of apple cider vinegar and two teaspoons of sugar, stir to combine. The dressing should be thin enough to easily toss with the salad, and not heavily coat it, if it is too thick add a bit more milk. The dressing should be a touch sweet and have that bite of apple cider vinegar, I usually add a smidge more sugar and vinegar until I get the right balance, if you need a larger batch double the recipe so there will be enough for the size of salad. When you are happy with the dressing, drizzle it over broccoli salad, and toss to lightly coat. This salad is best when the flavors have a chance to mingle for a bit, I like to chill mine for at least an hour or two before serving. The salty bacon and sweet raisins really complement the broccoli and the whole family loves it, it is also a hit at potlucks and disappears right away! The whole day was a lot of fun. I really enjoyed all the time with family! I am looking forward to the New Year and have some fun easy New Years crafts that I am working on for decorations. I hope everyone had a nice Christmas! My mom used to make ambrosia, so seeing it here brought a sweet memory. Lovely decor and foods for making memories. Thanks Gail! I love good old fashioned classic holiday foods, glad it brought back good memories. 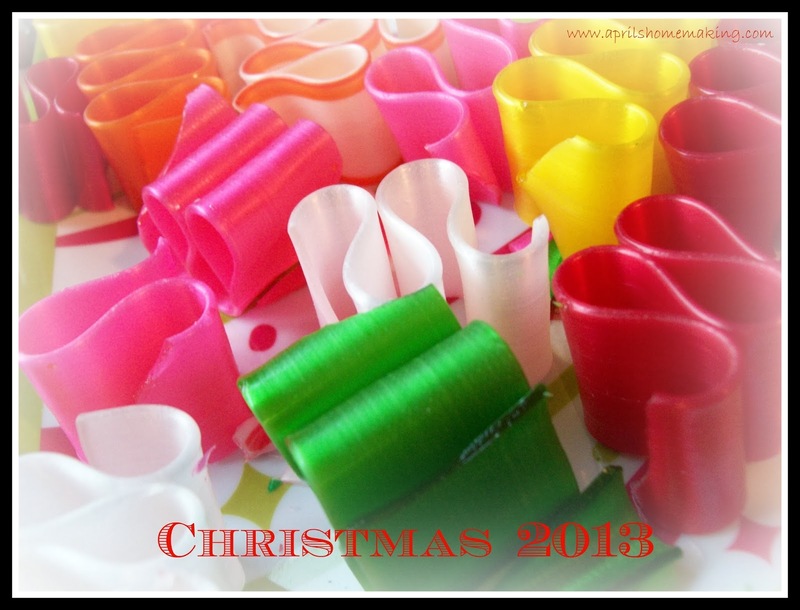 :) Have a Happy New Year!